Why Petermann Glacier and Fjord? The National Science Foundation (NSF) declined to fund a Physical-Ocean-Ice-Shelf-Experiment (POISE) at Petermann Fjord in northern Greenland this year. The reviews by three anonymous peers, a panel of eight scientists, and two sympathetic program managers were all very good, but not without criticism. Floating ice shelf of Petermann Glacier in August 2009 as seen from a helicopter of the Canadian Coast Guard Ship Henry Larsen. View is to the south-east with the glacier to the left and the ocean to the right. Photo by David Riedel, British Columbia. Our admittedly expensive 4-year proposal was rejected along with at least five competing proposals in the same general subject area, because we did not show why a study of ice-ocean interaction of glaciers and ice-sheets has to take place at Petermann Glacier, a remote location less than 800 miles from the North Pole. Claiming this glacier to be unique, we made a fatal mistake, because NSF cares little about each glacier, but cares much about the underlying physical problem, that is, how do tidewater glaciers with floating ice shelves interact with the ocean they float on. There are several glaciers in Greenland that have extensive ice shelves. To the best of my knowledge, they are all in northern Greenland. Nioghalvfjerdsfjorden and Petermann Fjord contain the largest floating areas exposed to the oceans on the east and west coasts of Greenland, respectively. 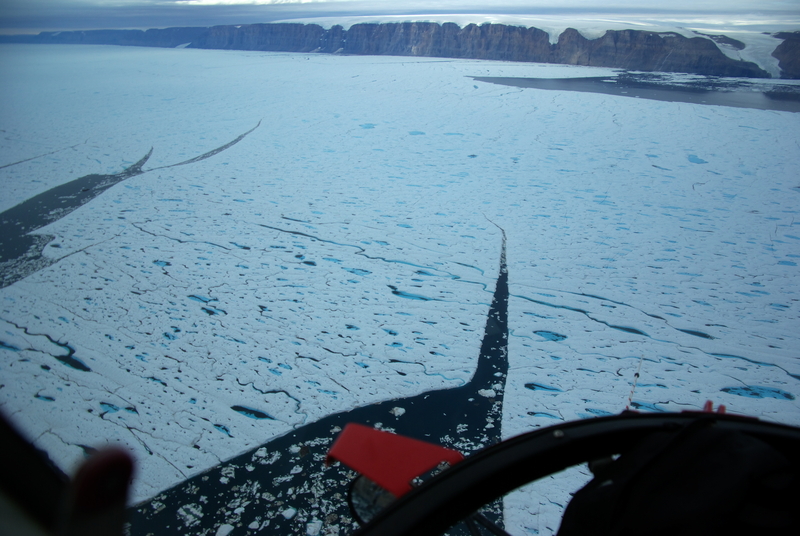 Both these glaciers have seen preliminary studies during the last 15 years including radar measurements that describe the geometry of the ice shelves, the bedrock below, as well as the ice streams to connect the glaciers to the inland ice. Smaller and less studied glaciers with past or present ice shelves are Steensby, Ryder, and C.F. Ostenfeldt in the north-west as well as Academy and Marie-Sophie glaciers in the north-east (Weidick, 1995). The most extensive ice shelves are located around Antarctica, however, and one thus may wonder, what uniform physics can and should be studied in northern Greenland that also applies to the ice sheets in the south? I would need some scaling law or normalization scheme that connects many glaciers into an organizational scheme. In physical oceanography the near-balance of a density-driven (internal) pressure gradient and the effects of a rotating earth provides a dynamical scale that connects river discharges off Delaware, with ice patterns off Eastern Greenland, and algae bloom patters off northern Norway, among many other phenomena. What dynamical metric connects the ice sheets of Greenland to each other and to those off Antarctica? This entry was posted in Global Warming, Ice Island, Oceanography and tagged Antarctica, glaciers, Greenland, NSF, Petermann. Bookmark the permalink.